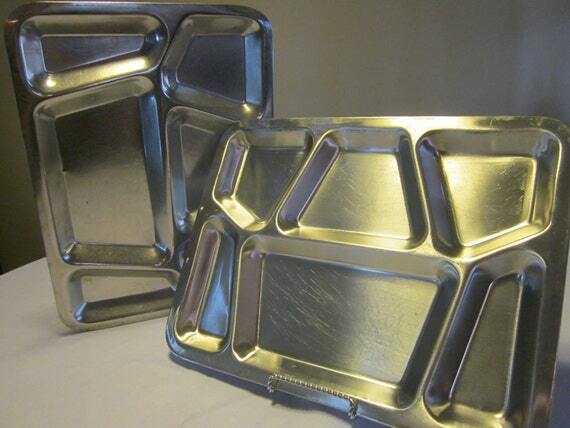 We ate on metal trays like the ones pictured at left. Tuesdays were usually chili day and also cinnamon roll day. Loved Tuesdays except when they'd switch out navy bean soup for chili. Because I liked (and still do) vegetables, I would use that to my advantage. You couldn't go back for seconds unless you ate everything. And a lot of kids didn't like vegetables (especially spinach) so I'd offer to eat their vegetables for them so they could go back. But I demanded their dessert in exchange. So I got more vegetables that I liked, plus more dessert. It was great. There are vegetables I won't eat, such as lima beans and brussel sprouts but they never served those at school, to my memory. But for the longest time I couldn't figure out why vegetables at school were so much better than the vegetables my mother served at home. Finally I figured out that the vegetables at school were canned and the ones at home were frozen. Canned vegetables, at least back then, had a lot of salt in them. The biggest difference was green beans. At school they were heavenly. At home, they were pedestrian. Even if you added salt they just didn't have that wonderful canned flavor. Sometimes I miss those school lunches. But most of the time, I don't. Or burrito day with corn and red sauce. When I was in school in the 80s, the big thing everyone got excited about was cheese zombies, basically a pan-sized baked grilled cheese sandwich cut into squares, loaded with grease, and dipped into tomato soup. Good times, but ten year olds with heart disease.